Feel the Burn | Jess Banks schools you. I’m sleeping pretty well, but I wake up exhausted every morning. This is Day 8 of a skull-crushing tension headache. Fears I’m forgetting something important plague me constantly. Activities that used to leave me with a two-hour adrenaline hangover now make me tired before I even start. My threshold for sensory overload is so low, I’m having small meltdowns several times a day. I stop taking phone calls. I avoid friends. I’m excellent at being the little cog in a big machine, but I need a solid sense of the macro to stay motivated. But lately, everything’s been so myopic that I can’t see my place in the larger efforts I’m working toward, and it hasn’t been good for me. I feel myself withdrawing, and I don’t like being powerless to stop it. It’s crunch time, and I’m more disengaged than ever. I called a dear friend for a lunch date, to ask him how he’s dealt with the burnout that must have been familiar in his super-intense job over the last year. Just seeing him makes colors brighter, but I need his advice, so I asked him how he manages to stay fresh over the long haul. Some of that advice is expected. You have to set boundaries and practice saying “no.” Be at home when you’re at home. Put away the cellphone and computer. Make yourself present for your loved ones, and don’t feel guilty when you do something you love that’s totally unrelated to the greater effort. Self-improvement can wait. Feed your soul. Rest. Some of his advice triggers an instant inner eyeroll, but I try to take it to heart, since I’m at such a loss with my own efforts. At the end of the day, take the time to write down one thing you did well. Accept praise. Don’t let doubts or second guesses stick around. Self-talk feels artificial, but it registers somewhere deep inside our brains, so do it anyway. I’m someone who has a negative, self-critical tape on endless replay at varying volumes in her mind all the time. These are difficult steps to imagine taking. I realize that part of what’s made me feel insignificant over the last several weeks is a lack of outside reinforcement for anything specific I do. I don’t know what I’m good at. It’s impossible for me to ask for praise, but I’m starving for it. Recognition by another human that your inner intentions and outer efforts are registering in the world is absolutely necessary. My friend holds my hands and tells me how much love he always senses pouring out of me toward every person I meet. I cry a little; I’m tearing up again now as I write this. In the grand scheme of things, the fact that I’m feeling burned out at last after over 14 months of non-stop effort and tension is only surprising in that it took this long. We all go through cycles of intense focus, followed by necessary disengagement. Only the daily grind of steady work is unnatural in this process, and constant effort is unhealthy and untenable. But if I want to relight the fire that burns inside me for the work that makes me valuable in the world, I have to do exactly what’s most difficult right now. I need to reach out to other people for that moment of human connection. I need to remember what I love about what I do, and let others see that. I need to ask for help seeing the Big Picture. I need to accept praise, even from myself. I need to make plans and dream dreams for what happens after this work is done. I need to keep creating, whether it’s adding just ten words on a writing project, or prepping my garden for planting, or baking cookies. I need to let small joys accumulate. 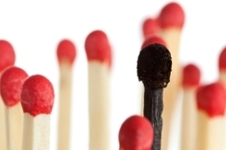 Burnout is real and natural, but the solution isn’t smothering the fire. It turns out, the answer is letting others help you feed the flames. One of your strengths is your openness to share your thoughts with others. Everyone has moments of doubts and low spirits. When you share your experiences, it shows others that it’s ok to struggle. In my current, middle-age adult life, I wait for motivation. Whether it takes 5 months or 4 years, I wait. It tends to be a slow pace, but I’m confortable with that.